Rows of shop houses spotting Chinese tiled roofs and yellow stained walls line the narrow alleys. Red lanterns hang from rusty ceilings, while creepy lalang tree branches hang from above. Red-and-green rickshaws stand alongside the traditional five-foot way and local ladies wearing conical straw hats amble along the streets balancing baskets of fruits on their shoulders. By the river banks, old men float on their crumbled wooden boats, waiting for the catch of their day. 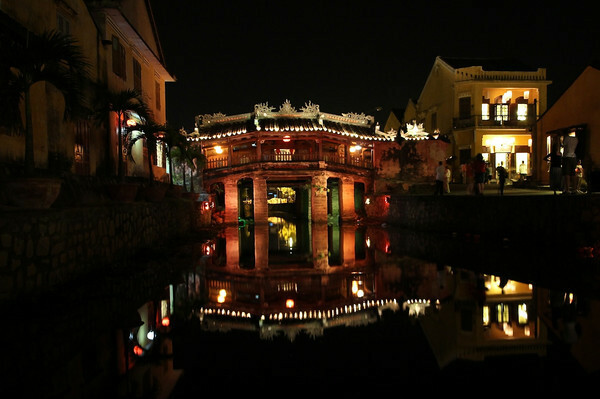 This is Hoi An, an ancient city oozing old world charm, offering time travel for the curious ones. 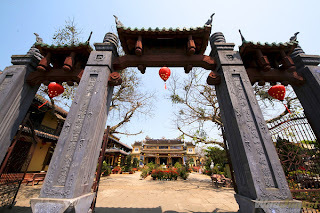 Set along the Thu Bon River, Hoi An was an international trading port back in the 17th century – Chinese, Japanese and European traders used to converge here, their traces now seen from the eclectic architecture in the Old Town. In the 18th century, Hanoi An was considered to be the best destination for trading in all of Southeast Asia. Japanese believed the heart of all of Asia, referring to the dragon, lay beneath the earth of the city. Thanks to appropriate measures, the architectural styles in Hoi An have been extremely well preserved, thereby earning the town UNESCO World Heritage status. Once here, it’s easy to see why. Hoi An’s beauty is obvious: from the 17th century edifices to the hectic market and calm river banks, the city has an inimitable flair. Naturally it has attracted hordes of tourists, but thankfully it has still retained a sense of identity. Over the past few days, we’ve been wandering through its Buddhist pagodas, shrines, alleys and walkways. Here’s a look at some of our favorite sights of the city. The centerpiece of the Old Town lies the small but historically rich Japanese Bridge, or Chua Cau, built in 1593 by the Japanese community. Spanning across a small stream off that branches off the Thu Bon River, this ancient bridge features a tiled roof and a small temple within, decked out in wooden flooring and faded statues. It was said that construction of the bridge had begun in the year of the monkey and finished in the year of the dog – thus one end of the bridge is guarded by wooden monkeys and the other by dogs. There is an entry fee of 90,000 dongs ($4.50) for the Old Town – but it entitles you to five of the 18 sites, and one of them is this bridge. There are hundreds of temples and assembly halls built by the Chinese expatriate residents together with Viet people. One of the most outstanding temples is Quan Cong Temple, recognized as a “National Historic and Cultural Site” for its well-preserved facade and interior. The assembly halls were built for the Chinese to socialize and hold meetings. They are typically named after the home region of their members, such as Fujian and Canton. The Cantonese Assembly Hall, or Quang Dong, was built in 1885. Featuring elaborate mural carvings and giant coils of incense, it almost resembles a temple. Take a peek at the half-hidden back yard and its pastel dragon statues. 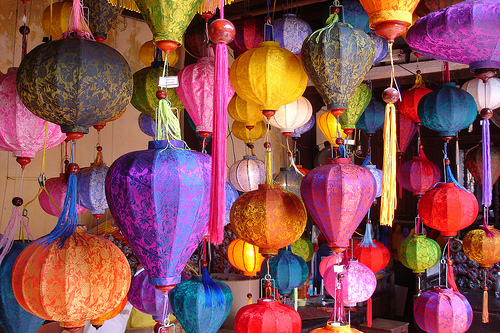 Housed in the 200-year-old Chinese trading house, the Hoi An Handicraft Workshop deserves a visit mainly for the cultural show (10.15am and 3.15pm) put up by traditional singers, dancers and musicians. While it’s largely touristic, it gives quite an interesting glimpse into Vietnamese traditional artistry. 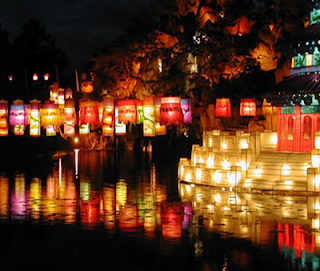 In the backyard, you can browse through the thousands of lanterns, silk embroideries and ceramic hand-made by local artisans. 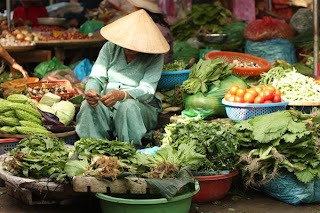 The bustling Central Market is a mishmash of colors, sounds and smells. Amidst the chaotic lines of stalls, you’ll find ladies selling spices, bright red chilli, silkworms, morning glory leaves, silk pyjamas and plenty of cheap souvenirs. The best time to visit is early in the morning, before 7am, when the dock is filled with fishermen unloading their catch. They are everywhere in Vietnam, especially here in Hoi An – temporary food stands, displaying fresh baguette and rice noodles, with mini-stools and plastic tables cluttered around them. Crouching on these tiny chairs, eating a bowl of Pho with wooden chopsticks, is an experience on its own. There’s a row of street food stalls around the riverfront boulevard of Bach Dang, as well as alleys running perpendicular to Tran Phu. By night, the glowing lights of the colorful lanterns seen all over town make dining out at these stalls even more atmospheric. 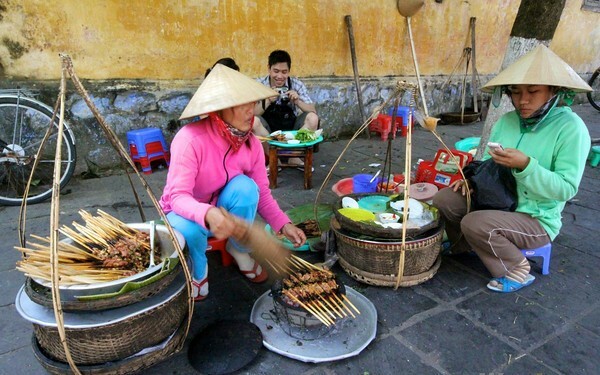 Hoi An is especially famous for these two dishes: cao lau, a doughy rice noodles topped with roast pork and fritters; ad white rose (banh bao), shrimp dumpling wrapped with white dough and drenched in spicy fish sauce. Weaving our way out of the Old Town on our rented scooter (just $5 a day), we found ourselves in the countryside very quickly, surrounded by emerald green rice paddies. The scenes along the drive are almost poetic – old ladies wearing the iconic Vietnamese hat bend their backs to work the fields; young men lead herds of water buffaloes across the greenery; while children fly their kites sky-high amidst the paddies. 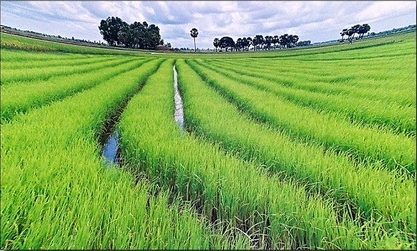 It’s refreshing to know just minutes away from the bustling town are vast stretches of green grass and Vietnam’s back country. 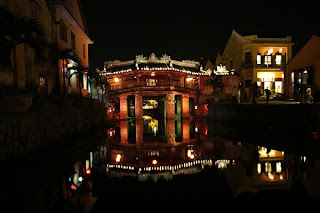 Hoi An has definitely left quite an imprint in my memories, with its gentle demeanors and poetic beauty. We’re moving onwards to Hue next, I wonder how it’ll compare to beautiful Hoi An. Has there been any particular city or town that has had the same effect on you?